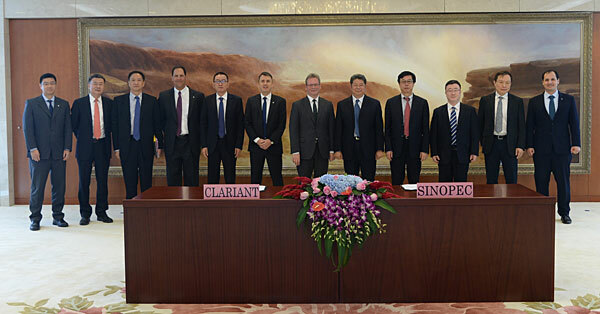 Clariant, a global provider of specialty chemicals, has announced that it has signed two key agreements with SINOPEC, China’s largest petroleum and chemical company. The agreements were signed in Beijing by the companies’ senior management on September 27, 2017. The first of these is the FCAS Series Sorbent Agreement in which SINOPEC has agreed to license its FCAS series of S-Zorb sorbent to Clariant. The cooperation agreement will allow Clariant to scale up the catalyst product portfolio for commercial production of low-sulphur gasoline. The second is the FCC (Fluid Catalytic Cracking) Agency Agreement between Sinopec Catalyst Company (SCC) and Clariant Qatar W.L.L. stating that Clariant Qatar W.L.L. will be the representative for Sinopec’s FCC catalysts to oil refineries in Qatar. FCC naphtha is the major contributor to the gasoline pool. However, it typically contains up to 2,000 ppm wt. sulphur. As the China V specification requires a sulphur concentration of below 10 ppm wt., sulphur removal is essential. Hydrodesulphurisation, a method widely used to remove sulphur from naphtha, requires a considerable amount of hydrogen, and results in the loss of RON (research octane number). In contrast, the S-Zorb process uses catalysts to adsorb all sulphur species from FCC gasoline with high RON retention and high liquid yield. Moreover, the single step process requires no recycle streams, and consumes significantly less hydrogen. These factors have made S-Zorb a technology of choice in China for upgrading gasoline from China National IV (equivalent to EURO IV) to China National V (equivalent to EURO V) standards. Since 2001, Clariant has partnered with SINOPEC to supply next generation S-Zorb catalysts for producing low-sulphur gasoline at more than 25 world-scale units in China and USA. In all cases, the technology and catalysts have demonstrated their superior performance in clean energy production and emission control.